I’ve made a game named Pondrian, the game is fairly simple, just a pong clone. 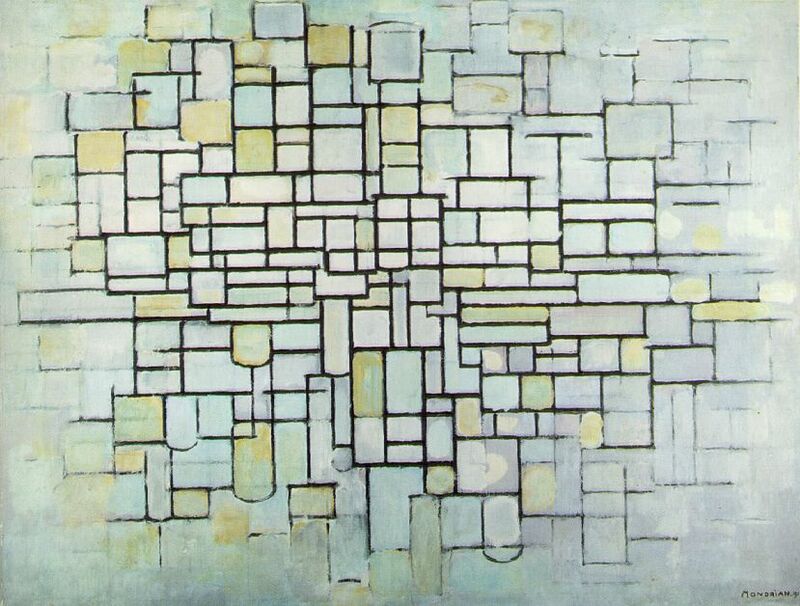 This post will explain about Piet Mondrian, De Stijl, and decisions in the creation of Pondrian. From 1917 and up to 1931 a group of Dutch people and some friends, made a body of art and design work that were named “De Stijl”, that is the Dutch phrase for “The Style”, it was work that is considered to be part of a larger art movement of “neo-plasticism”, it involved paintings, architecture, furniture design, poetry, music, and many other forms of art and design (note: I believe art and design to not have much difference between them, but this is a discussion for another day). It started among many other reasons, because of several new art styles that appeared in early 1900s, like Cubism and Impressionism, and also because the Dutch decided to be neutral in the first world war (that started in 1914), thus they were stuck inside their own country, and needed to develop their own art without much more external influences. A artist named Theo van Doesburg started around that time meeting artists, and after a sufficient amount of them was met, Theo started a magazine named “De Stijl”, that advocated a new form of art in the Netherlands, and defended an art form based on simplicity and basic elements of each art, in the most developed case, the visual arts, this was using only orthogonal lines (ie: vertical and horizontal, sometimes in other directions too, but never arcs, or non-straight lines) and primary colours, at least what they believed then to be the primary colours (black, white, blue, red, yellow). Theo’s journal featured several art manifestos, signed by all formal members of the “De Stijl” group, and many interesting essays, Piet Mondrian a Dutch-born artist, but that was living in France but got stuck in the Netherlands because of the war (he was only visiting when the war broke out, and thus could not return to Paris), wrote several essays about Neo-Plasticism, and in fact invented the term, his essays describe very precisely what De Stijl artists created in visual arts, his essays mostly ignored other forms of art, but he made a friendship with a musician for example, and still ended influencing other forms of art. Among the most iconic De Stijl works, demonstrating very clearly the use of only basic elements of an art form were paintings by Theo and Mondrian, a house built by Gerrit Rietvelt, and a chair designed by Rietvelt too. After the first world war ended, external influences came again to influence the group, among them Bauhaus (a german architecture and design school), Russian Construtivism, and even a bit of Dadaism. 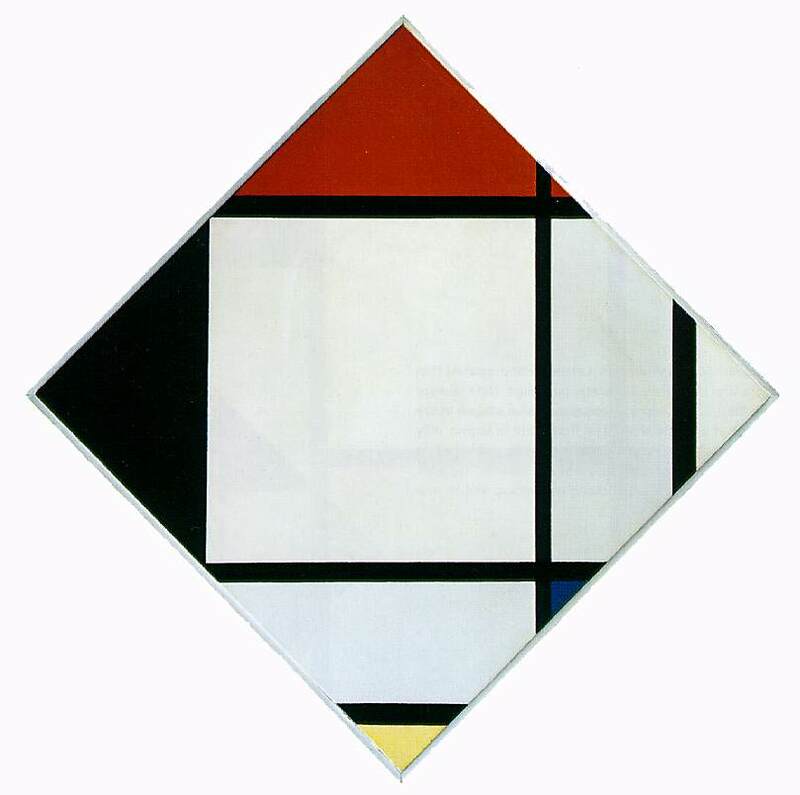 Theo in particular started to defend that diagonal lines were more pure and basic than vertical and horizontal lines, this made Piet Mondrian leave the group formally in 1924, but he remained making his art still alongside what we can consider De Stijl, also many other characters joined and left. Theo died 1931, and with him went away the magazine, and a formal group, some artists remained working with what they developed on the time, including Mondrian and Rietveld, some other artists abandoned the style completely, and returned to their classical art roots, making again photo-like paintings for example. 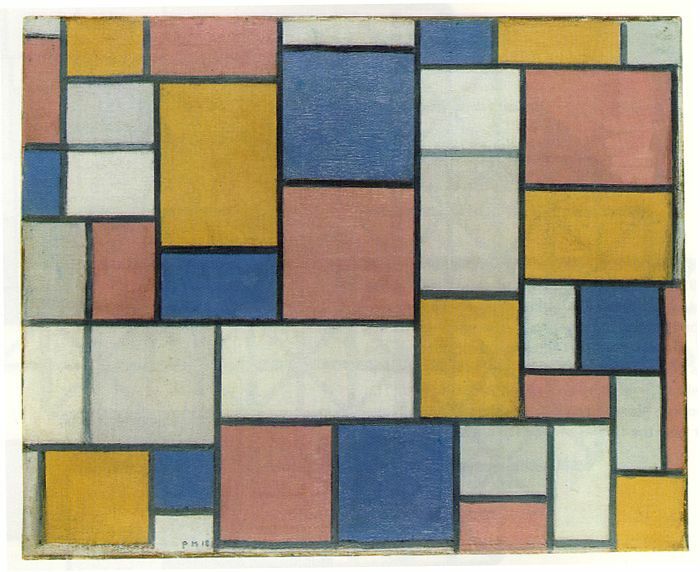 Born as Pieter Cornelis Mondriaan in 1872, and renamed himself to Mondrian in 1906, Piet (a nickname, never his legal name), learned visual arts in early childhood, his father was a school teacher and also a drawing teacher, and taught Piet very well in the visual arts. 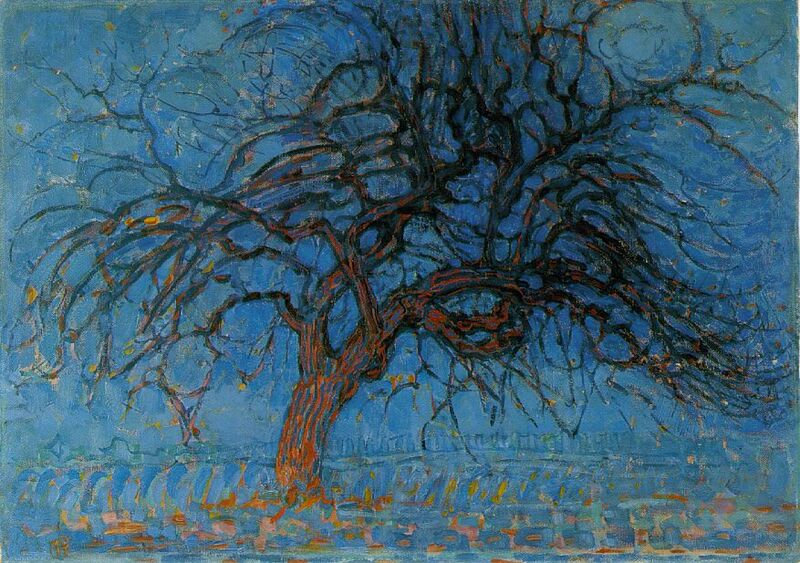 His earliest art was very normal, with photorealistic paintings of varied scenes, it also showed he was a skilled painter, later he started experimenting, he made in 1908 a painting named “Avond”, it was just a tree, using realistic shape, but primary colours only. 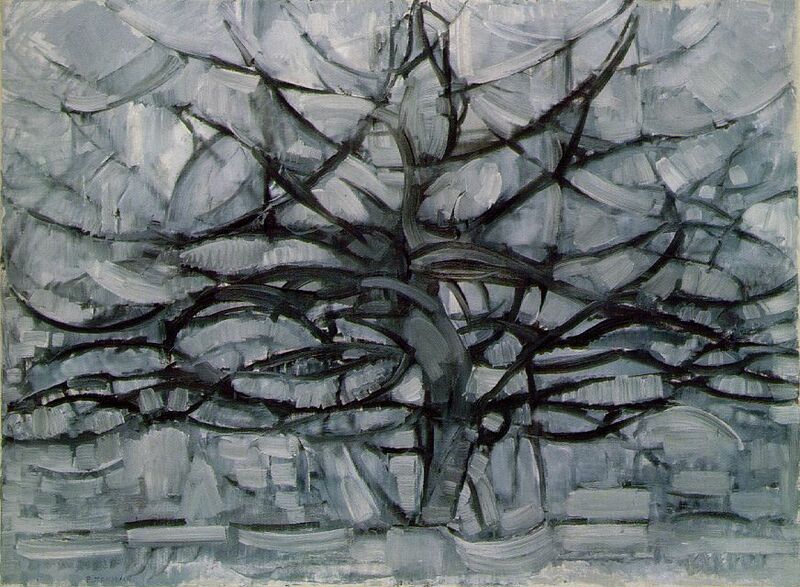 In 1911 he moved to Paris and produced a painting named “Gray Tree”, where he tried to draw a tree without colours, and in cubist style, result of living in Paris (where for example we also had Picasso). 1913 we can see a step further, the painting “Composition II” looks like a sort of tree, but made only of vertical lines and some shades of primary colours. Then we have in 1918, already after meeting Theo and moving back to Netherlands a work that is more obvious in De Stijl style, the painting Composition with Colour Planes and Gray Lines 1. 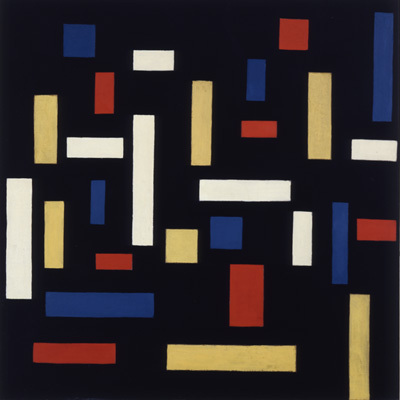 The work that I decided to reference was his most famous works after 1920, for example the 1925 Lozenge Composition with Red, Black, Blue, and Yellow. I started making games at a very young age, when I was still 6 years old my dad started to teach me how to play with DOS Batch files, and when I was eight he gave me a book in MSX Basic programming, I did not had a MSX, I had a 286 with GWBASIC, but I spent many afternoons developing my own little games (the coolest one was a side scrolling helicopter simulator, sadly it was also very buggy, some MSX terrain drawing routines behaved very badly on the IBM PC). My first modern game programming API, without being a mod was Allegro 4, the problem was that back then I feel in love with developing engines instead of games, and made many many many half-complete engines that I never used (nor anyone else). When I decided to learn XNA, I also decided that the most important was NOT make a engine, but instead make a full game, a simple one, for this I had chosen Pong. 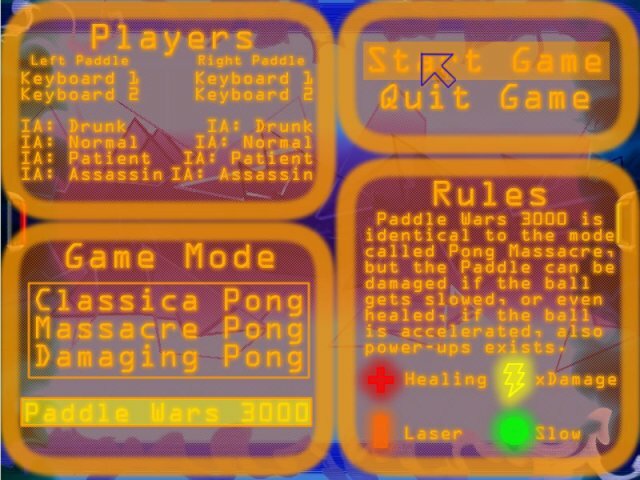 The result of that was Paddle Wars 3000, a pong game with powerups, Paddle Wars 3000 spawned its own series later (Paddle Wars), but the idea to do pong games to test a API remained. A friend of mine then suggested me to use Piet Mondrian paintings as inspiration, he thought that a moving painting as game would be funny, thus the idea of Pondrian was born. The first change to implement Pondrian was when testing Sparrow SDK for iOS, it was made in four hours in a more or less idle day, I won’t explain more about these past Pondrian versions because there is more information here on this site. The current version was made to learn Allegro 5 while using C (not C++). The first decision was the direction of play, despite most pong games using a horizontal field, I decided to use a square field, with vertical play, the reason for that it is to look closer to a painting, without breaking the gameplay too much, also it is easier to control things with the mouse in the horizontal than in the vertical. After this, I had to decide how to make the play more dynamic, just reflecting the ball around is boring, very boring, and might end in situations where no player can win, and that you can just sit doing the same movements, or no movement at all, in past games I used a simulated “curved” paddle, where the farther the ball is from the center, the more its angle of reflection change, but this has two issues, first, the paddle is clearly a rectangle, and not curved at all, second, it makes the game too hard for many players, many people cannot grasp the paddle curvature, and much less move to the position where they need to, all my past paddle games featured paddle curvature and paddle friction (ie: you could “kick” the ball by moving the paddle while the ball was in contact with it), and clearly few players could play them effectively, this time I decided instead to make the ball randomly speed up, this mean the only skill you need is actually tracking the ball, and not allowing it to cross into your end line. Another gameplay decision to make was how to handle AI difficulty, so I decided to give the AI a maximum speed to move toward the ball, and then increase this as the player win, and decrease if the player starts losing too much. Then I had to make some feedback decisions, first, I did not wanted to make a visible score text, to avoid ruining the painting visuals, so I made the score control sound pitch, when the ball hits a paddle, or a score is made, a appropriate sound plays, but with pitch depending on the score. Also I made the ball size “wooble” depending on what it hit, and a extra very visible wooble when it gets sped up or a game starts. The game has no music because I did not found a public domain recording of appropriate music, I considered for example using one of the tracks of Proeven van Stijlkunst (youtube recording), this was a collection of piano pieces made by Jakob van Domselaer, a close friend of Mondrian while in the Netherlands, and a musician that tried to apply De Stijl principles to music. This entry was posted in none on 20 de January de 2014 by Maurício Gomes.